Owned and operated by EMAK Marsa Alam for Management & Operation Airports, Marsa Alam International Airport is located in Marsa Alam in Egypt. Initiated in 2003, Marsa Alam International Airport is a growing airport that handled 938,858 passengers in 2009. The main airlines operating at Marsa Alam International Airport are Air Berlin, Condor, Mistral Air, Thomson Airways, TUIfly, Travel Service Airlines, Travel Service Airlines, Blue Panorama, Air Italy, etc. The travelers can get the essential information about the flights and other tourist places at Airline and tourist office. The travelers waiting for the flights can relax at VIP/ Private Aircraft Lounge. The other facilities offered at Marsa Alam International Airport are cash dispensers, banks, police station, medical facilities, book shops, retail outlets and other duty free shops. Renting a car is the easiest and the most accessible way to travel to or from the airport. Located in south-eastern Egypt, on the west coast of the Red Sea, Marsa Alam is a beautiful town served by the Marsa Alam International Airport. The perfect location and the beautiful paradise filled with palm trees, mangroves and sea costs make Marsa Alma a perfect holiday destination. Marsa Alam has many popular diving sits which attracts lot of scuba divers. The tourists can also enjoy the beautiful sightings of spinner dolphins, dugongs and hammerhead sharks. The Emerald Mines and the Temple of Seti Iat Khanais are the two other famous attractions of the city. 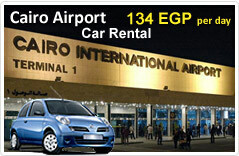 Egypt Cars Rental is a renowned car hiring company operating numerous rental locations throughout Egypt. The travelers on a business or leisure trip can easily rent a car with Egypt Cars Rental and get luxurious car hire service at the most nominal rates. At Egypt Cars Rental the travelers can get an exclusive range of vehicles which ranges from economical to luxurious options. The travelers can choose the cars that suit their requirements and pick them from the chosen rental location.